The Mondial de l’Automobile motor show taking place in Paris until 16 October presents the latest proposals from all around the world. Magneti Marelli technology has been adopted for a number of presentations in all segments, demonstrating the wide range of products available, made to satisfy the requirements of carmakers in all fields. After having provided parts for the Ferrari LaFerrari in 2013, Magneti Marelli has also been chosen to provide the hybrid power unit for the new “Aperta” version of the supercar from Maranello. LaFerrari Aperta carries the HY-KERS system, which Magneti Marelli accompanies with electric motors and various electronic components for management and control. LaFerrari’s HY-KERS system has a total output of 963 horsepower and is made up of a Ferrari V12 6.3 litre thermal power unit, capable of providing 800 horsepower, and an electronic part developed together with Magneti Marelli comprising of two electric motors (one main and one for auxiliary systems) for a peak output of 120 kW (163 hp). Magneti Marelli supplies dedicated technology for the Lighting field (high-intensity Bi-Xenon headlights and LED lights), Powertrain (throttle body) and Electronic Systems with 10 electronic Control Units dedicated to the control of the standard functions of the vehicle including headlights, Superlift systems, the body computer, electric actuator for exhaust collection, the electronic control unit for the Dual Clutch gearbox and driver and passenger door modules. Again in the high-performance car sector, Magneti Marelli supplies lighting technology for the new Mercedes-Benz AMG GT and GT-R with adaptive Full LED headlamps. Lighting systems on the restyled Porsche Panamera which adopts exclusively-designed LED rear lamps created by Magneti Marelli Automotive Lighting, while the electronic throttle body and exhaust system components are also provided by Magneti Marelli. Important news from for FCA, with two new power units for the Alfa Romeo Giulia Veloce. A new 280 hp 2.0 Turbo petrol engine and a 210 hp 2.2 Turbo Diesel engine, both containing Magneti Marelli Powertrain technology, such as the engine control unit and air intake manifold on the 2.0 Turbo petrol, and the air intake manifold and motorised throttle for the 2.2 Turbo Diesel. Again for the Giulia, Magneti Marelli’s contribution also includes the halogen and Xenon headlights, LED lights, the infotainment system with an 8.8” TFT “black panel” effect and parts for the exhaust and suspension systems. Paris also sees the presentation of new applications for the DCT (Dual Clutch Transmission) on the Fiat 500X 120 hp 1.6 Multijet, Fiat Tipo 120 hp 1.6 diesel, and the Jeep Renegade 1.6 diesel (with the exclusive DDCT system with oil-free double disk clutch). For these applications, Magneti Marelli supplies control units and hydraulic kits. Numerous multimedia totems are also present on the FCA stands, which present and provide detailed information on the Magneti Marelli technology adopted in the group’s models. In particular, on the Alfa Romeo stand, an interactive console with touch screen technology allows visitors to navigate virtually inside the new Alfa Romeo Giulia Veloce, receiving in-depth information on Alfa Romeo and Magneti Marelli technology. 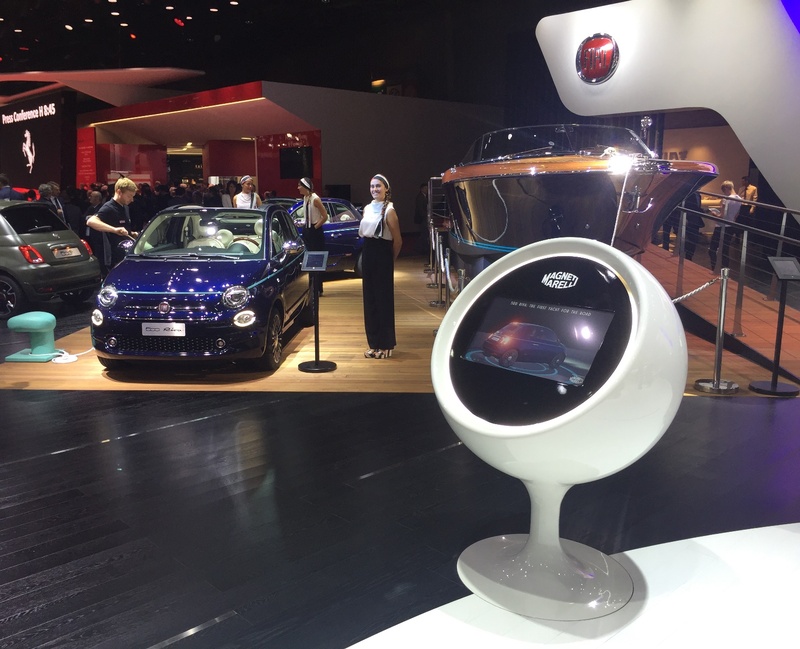 Along the same lines, the Fiat stand contains a Magneti Marelli interactive totem which, again through touch screen technology, shows the main Magneti Marelli technology present in the new Fiat 500 Riva. By navigating on the display, viewers can discover the front and rear lamps clusters on the vehicle, which are made by Magneti Marelli Automotive Lighting, as well as the 7” TFT digital instrument cluster and the Dualogic semi-automatic transmission. Moving on to the technology present on the vehicles on display in Paris, Magneti Marelli Automotive Lighting systems are to be found on the new Audi A5 and Q5 which have made their debut in Paris, and which offer a wide range of headlamps including 25 watt Bi-Xenon, LED and LED Matrix systems, fitted with single independent LEDs which harmonise, in real time, the intensity of light produced according to speed and the type of terrain. Magneti Marelli also supplies the instrument clusters with digital and analogic displays on the Audi A5 and Q5 models. Lighting technology is also to be found on the Peugeot 3008 and 5008 (LED rear lamps) and the Renault Megane Station Wagon and Clio which are fitted with Magneti Marelli rear lamps (and also headlamps on the Clio). Electronic systems have been applied in various sectors, beginning with the restyled BMW i3 which adopts an infotainment system which communicates with the vehicle’s “system”, also to monitor the charge level of the batteries and inform the driver on the remaining range; all information is available on a large touch screen. Magneti Marelli infotainment systems have also been adopted for the BMW 3 Series GT. Magneti Marelli Electronic Systems are also present on the new SUV Peugeot 3008 and 5008 with the 12” i-Cockpit and a 8” infotainment display. These are TFT (Thin Film Transistor) displays which show information provided by the vehicle and the infotainment system. The instrument cluster can be reconfigured and comes with 3D technology. The Citroën C3 offers the telematic box (T-BOX), technology which paves the way for new models of mobility in line with safety and security, sustainability and new trends in legislation (eCall). In the Powertrain field, Magneti Marelli technology has been chosen by the PSA group for the throttle body for the new Citroën C3, Peugeot 3008 and Peugeot 5008. In the Volkswagen group, throttles body have also been selected for the Skoda Kodiaq and the Audi A5 Sportback and Q5. Magneti Marelli technology can also be found in the field of Exhaust Systems (on the Skoda Kodiaq, Suzuki SX4 S-Cross), Suspension Systems and Shock Absorbers (BMW 3 Series GT, Citroën C3). Magneti Marelli designs and produces advanced systems and components for the automotive industry. With 89 production units, 12 R&D centres and 30 application centres in 19 countries, approximately 40,500 employees and a turnover of 7.3 billion Euro in 2015, the group supplies all the major carmakers in Europe, North and South America and the Far East. Business areas include Electronic Systems, Lighting, Powertrain, Suspension Systems and Shock Absorbers, Exhaust Systems, Aftermarket Parts & Services, Plastic Components and Modules, and Motorsport. Magneti Marelli is part of FCA.